Didier Drogba and Nicolas Anelka Heading Home? How events off the field could lead to some big changes for Chinese football. They were supposed to signal a change in the fortunes of Chinese football but if reports are to be believed – and we’ll come to that later – Didier Drogba and Nicolas Anelka may be back in Europe before they even had chance to visit the Great Wall. Both strikers came from Chelsea, the European champions, and are world stars and their pay reflects their stature in the world of football. Anelka, formerly of Real Madrid, Liverpool and Arsenal, was signed in December in a deal that made international headlines. 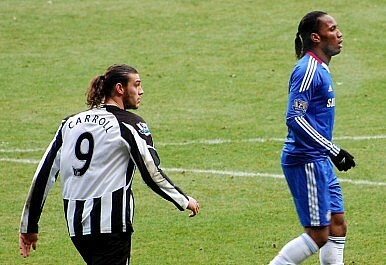 He was joined in July by an even bigger star in the shape of Drogba. That deal really did lift the profile of the Chinese Super League. The season has been something of a difficult one with Shanghai Shenhua Football Club languishing near the bottom for the first four months but the arrival of Drogba has seen a change in atmosphere and performances. Slowly but surely, the Blues have started to climb the table. A finish of seventh or eighth would be disappointing considering the money that had been spent but it would still be an improvement on an 11th place finish last season. So just when the club was able to start focusing on the remaining games of the season and perhaps even start planning for 2013 with some degree of confidence, off the field events started to take over. Owner Zhu Jun has a 28.5% stake in the club and, according to reports in the local media, will only continue to pay his share of the costs in running the club if he is given more control. There are five other shareholders and they agreed in 2007 that if Zhu invested around $22 million over two years then he would take 70% of the stake. The Oriental Sports Daily said that Zhu had invested almost $90 million while the other shareholders spent nothing but still did not have a greater share of control. There were reports that Zhu had written to the other shareholders to state that if he did not receive greater control, he would fund the club according to his stake i.e. he would cover only 28.5% of the costs. If that comes to pass, then it is likely that the club would seek to release the high earning Drogba and Anelka who are paid a salary reported to be over $600,000 a week, more than the rest of the team combined. "It is annoying and has had a bad effect on many of our tasks," a club official was quoted as saying. "The biggest problem is that the operation and financing work of the club cannot be carried out normally. The equity stakes issue has become the biggest bottleneck for the development of Shenhua." All Chinese fans, and many around the world, are waiting to see what happens. Is China's Football Boom Already Over? Nicolas Anelka and Didier Drogba have left Shanghai Shenhua, raising questions about soccer in China. "I have never sold a match.."Hijab Allowed Back on the Football FieldWorld Cup Hopes Hang in the Balance for Japan, AustraliaChinese Super League Hires Beckham as Ambassador Japan: A Football, Rugby Powerhouse in the Making?